Enjoy our fun tornado facts for kids! Learn what tornadoes are, how fast they spin, how far they can travel, where most tornadoes occur, the difference between an F0 tornado and an F5 tornado, what a waterspout is and much more. Read on to check out our wide range of interesting information about twisters. A tornado is a rapidly spinning tube of air that touches both the ground and a cloud above. Tornadoes are sometimes called twisters. Not all tornadoes are visible but their high wind speeds and rapid rotation often form a visible funnel of condensed water. The Fujita Scale is a common way of measuring the strength of tornadoes. The scale ranges from F0 tornadoes that cause minimal damage through to F5 tornadoes which cause massive damage. Most tornadoes have wind speeds less than 100 miles per hour (161 kilometres per hour). Extreme tornadoes can reach wind speeds of over 300 miles per hour (483 kilometres per hour). Most tornadoes travel a few miles before exhausting themselves. Extreme tornadoes can travel much further, sometimes over 100 miles (161kilometres). The Tri-State Tornado that travelled through parts of Missouri, Illinois and Indiana in 1925 left a path of destruction over 219 miles (352 kilometres) long. The Tri-State Tornado was the deadliest tornado in US history, killing 695 people. The USA averages around 1200 tornadoes every year, more than any other country. The majority of these tornadoes occur in a geographically unique area nicknamed ‘Tornado Alley’. US States most often hit by tornadoes include Texas, Kansas, Oklahoma and Florida. In 1989 the deadliest tornado ever recorded in the world killed around 1300 people in Bangladesh. In the southern hemisphere tornadoes usually rotate in a clockwise direction. In the northern hemisphere tornadoes usually rotate in a counterclockwise direction. 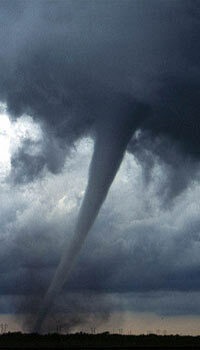 A tornado that occurs over water is often called a waterspout. Weather radars are used to detect tornadoes and give advanced warning. Basements and other underground areas are the safest places to seek refuge during a tornado. It is also a good idea to stay away from windows. Make a tornado in a bottle or watch some amazing tornado video footage.